Developer notes written down before they get lost. For the last couple of days I have been playing with Docker. In a nutshell Docker is a tool that lets you create images and run so called containers. It uses Linux Containers (LXC) under the hood. What appears to be yet another virtualization solution, is in fact a very lightweight way to setup, manage and run “processes in a box”. Docker comes with a great tutorial and a reasonable documentation. So I won’t go into any details here. There are also some very good posts from Marek Goldmann which helped me a lot getting started. 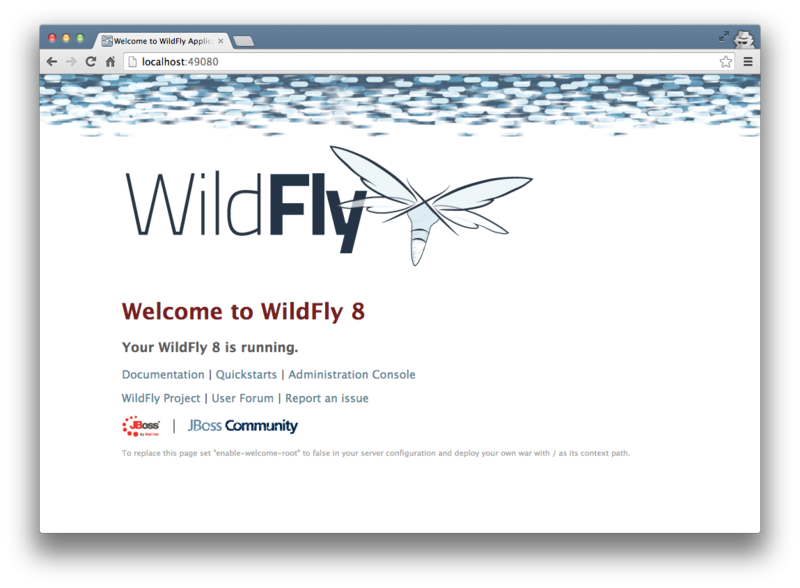 In the remaining part of this post I will show you how to setup both a WildFly standalone server and a domain with multiple hosts and servers. Here we go! I assume you already have installed Docker. If not please refer to the offical documentation on how to setup Docker on your machine. The following assumes you’re using Docker 0.7.0. Docker has a great feature which enables inter-container communication. This is done by specifying the link parameter. When linking two containers Docker will use the exposed ports of the container to create a secure tunnel for the parent to access. This feature is used in the WildFly domain for the communication between the domain controller and the hosts. Unfortunately in the current WildFly Beta there’s a problem if you want to access the admin console of a WildFly instance running inside a Docker container. I assume this will be fixed once WildFly GA is available. For the time being you can only use the CLI. If you need the console, you can use for instance EAP 6.2 which is not affected by this limitation. You can find Dockerfiles on my GitHub account using EAP. However please note that there’s no EAP distribution included. You have to provide one on your own. Using Docker it is really easy to setup a WildFly domain. Adding / removing hosts is just a matter of starting / stopping Docker containers. Docker offers also a rich API. So setting up your domain could also be done using a nifty web front-end where you ‘click together’ your server groups, hosts and servers. The Dockerfiles, images and containers would then be created based on your input - all fully automatically!